After conducting extensive forensic examinations at the Emdads Halal Food Centre in Derby Road, Southampton, police and fire investigators have confirmed that they are treating the fire as suspicious. 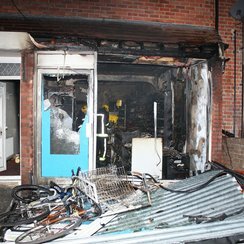 The shop was completely destroyed by the fire which emergency services were called to just before 5am on Thursday, January 27. 18 people were evacuated from a flat above the shop and from the two adjoining properties. A young baby was treated after breathing in smoke, and oen man had to jump out of a window to escape. Police officers have been conducting house to house enquiries in the area and displaying witness appeal posters asking anyone who may have seen or heard anything suspicious to contact them. Officers will also be viewing CCTV footage from cameras in the area to see if they are able to provide them with any information. Firecrews say a working smoke alarm probably saved the lives of everyone involved. “By giving an early warning of fire, the working smoke alarm has given precious minutes for these residents to escape, and has no doubt saved their lives. This was a challenging fire that was well-alight on our arrival and our specialist fire investigation team are now working closely with the Police to establish the cause. “Hampshire Fire and Rescue Service strongly recommends that you have at least one working smoke alarm on every level of your home. Ideally these will be situated in every other room except your kitchen and bathroom, as the smoke from cooking and steam from hot water can cause false alarms.